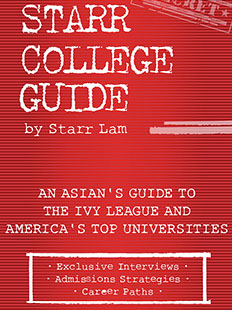 Based on exclusive interviews with 115 students, alumni, and admissions chairs from America’s top colleges, Starr College Guide is a college guide and admissions manual to the Ivy League and other elite American schools. The interviewees, most of whom are from Greater China and the Asia-Pacific region, personalize the college experience for Asian students and their families around the world, and they share their own strategies and secrets for getting admitted. The admissions section of this book contains very clear-cut advice straight from regional admissions personnel from Yale, Penn, and Brown. This part of the book details the scores needed for acceptance and tells how to build resumes and stories tailor-made for each university. In addition, this book highlights the career paths graduates are likely to embark on after graduation. Featuring practical admissions strategies and real-life success stories, Starr College Guide is a must for any student from Asia who wants to gain an advantage in the Ivy League admissions process.